An artisan jewelry journey in color, texture and fun. 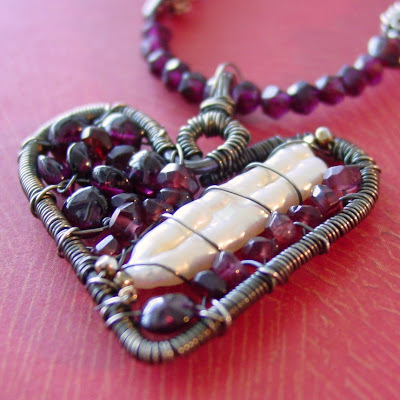 Beaded jewelry with handcrafted sterling silver is my focus and joy. Checking to see if I can import some of my own images into Polyvore. This piece I gave away in December to another member of Texas Wax at the Christmas party gift exchange. I sure hope he likes it. For some things, Kermit was wrong - It's easy being green! 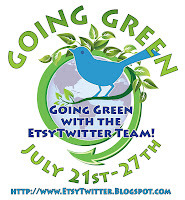 The whole gang behind the Etsy Twitter Team is going green for July! 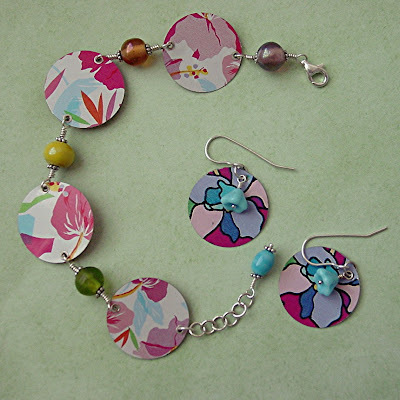 As for me, I am jumping on the bandwagon with a brand new collection of jewelry I am calling "Upcycled Bling". I have amassed a collection of vintage and thrift store tins with amazing graphics and converted them to fun and funky pieces of upcycled bling. One of my commitments in the creation of these pieces is that I cannot buy anything new to put into a piece - everything must come out of my existing stash of inventory. Anyone who has seen my stash may think this is no big deal, as surely I must have at least one of everything in the world, but this includes all my findings and other supplies that I keep in limited supply. So for some things I am getting creative, and other things I am rolling out the silver smithing and making things DIY. As much as I appreciate those folks in China who roll out the jump rings at amazing affordable prices - No - I'm making them myself! 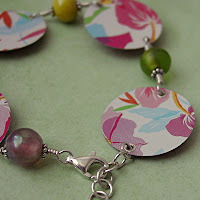 And who says chains cannot be re-purposed into links? So, check out the new section in my shop, and check out all the "green" things coming from all the wonderful folks in the Etsy Twitter Team. 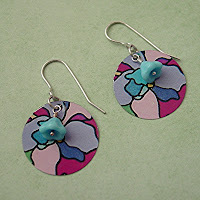 As for me, I'll be including these earrings in the promotional giveaway to occur next week. Stay tuned for more details! 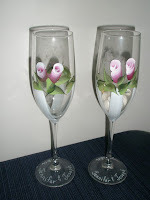 What inspires you to make your items/craft? My mom and colors. My mom is a painter and has always brought crafts into my life. Do you have a special place in your home that you work in?? My craft is movable so I normally work in front of the TV or outside on our porch. When putting my blankets together I use my kitchen table (card table). If I'm going away its one of the first things I pack. What else do you do besides the crafts?? I teach during the school year. during the summers I love to watch baseball with my husband and spend time with my family. If you could go any place in the world where would you go?? Rome!! I have always wanted to travel there for a honeymoon. when I got married my husband could only get 24 hours leave from the military so I never got a honeymoon. He then deployed overseas in our first year of marriage. Hopefully I will get a teaching job this year and go next summer!! What is your favorite item to make in your shop? and why?? 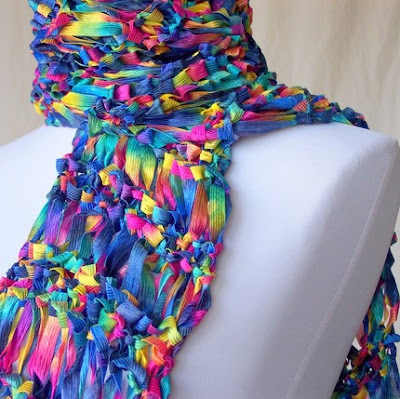 Foxy G Knits' blog on artists who create from the heart has featured me! I want to thank her for the fabulous write up - and while you're there, be sure to check out all the wonderful folks she's written on besides me. You will find an impressive array of artists who give back through their work. I'm humbled to be a part of this community she is highlighting. Thanks Lois! Gotta Love the Twitter Team - They're the Best! I'm the Etsy Twitter Shop of the Week! So many great folks with so many great handmade items - check out the list of participants on the blog, and you can search tags on Etsy with the term "etsytwitter team", too. The Team can be checked out on Twitter, too, with a search on the tag #etsytwitter - lots of promotions and sales to be found! It's Spring, and I Love Green! Wonderful group of folks from Etsy have created a Twitter mutual admiration team - check out the lovelies in lampwork and seaglass from this week's featured member: Renee Suich. 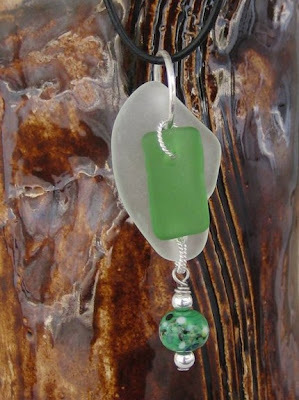 I absolutely love the way she has combined found sea glass (well, Lake Erie glass) and her beautiful lampwork in the piece pictured (click on the pic to take you straight there). 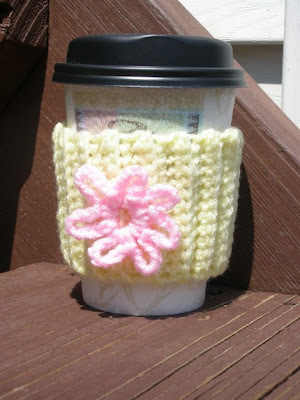 A perfect piece for a spring day, don't ya think? 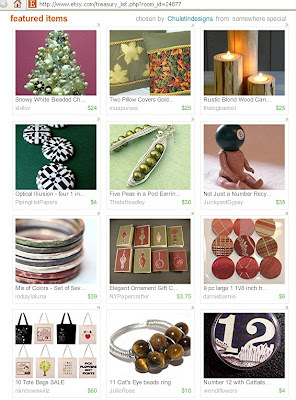 My Five Peas in a Pod earrings made it to an Etsy Treasury today! It is always an honor for someone to select one of your items to showcase. These are the collections that are selected to be on the Front Page of Etsy when they are especially beautiful. If you've never visited Etsy, you may wonder what that means, so I'll give you the bottom line - FREE ADVERTISING when it happens. you see, when it happens, thousands of people see your item. So thank you, chuletindesigns for including me in your selections. This particular Treasury is funky enough that it might just make it. Probably because of that strange little doll. A bit creepy, don't you think? In general, Treasuries that are selected for the Front Page are considered the creme de la creme. To my knowledge, I've never been on the Front Page. Maybe someday. It all started with daisy chain chokers in junior high...I've been hooked on beads ever since. I love "rocks" the most, but glass and crystal are fun, too, especially funky-beautiful beads from Africa. I share my designs through my shop on Etsy, which serves as a stress-reducing supplement to my "real" life as a public health consultant in infectious disease and emergency preparedness. look who's talking about that's Headley! This is a Flickr badge showing public photos from thats Headley Jewelry Designs. Make your own badge here.